Spring has finally came and I'm super excited. Not only has Spring Cleaning started in our home, but so has the nesting for me. I'm beginning to de-clutter and get rid of items that I don't need to make room for more things. One thing I've changed so far in our house has been the hand soap we use in the bathroom. I've put away all Winter smelling soaps and exchanged them for Spring/Summer scents. I make sure that hands in our house are washed multiple times a day because since this past Winter was pretty brutal to pretty much everyone, I was constantly trying to prevent anyone in our house getting sick again. That's why I was pretty excited to try Dial's new Deep Cleansing Moisturizing Hand Soaps. The newly designed bottle and pump come in three new scents, Yellow Raspberry, Water Blossoms and Coconut Lime Verbena. I got to try all but the Yellow Raspberry, but I can't wait to buy it in stores. I absolutely love the smell of both hand soaps I got to try. They reminded me of the expensive hand soaps you would buy in the mall, but at a way better price. They definitely made me feel like Summer was right around the corner, which is awesome. When washing your hands with these soaps you could feel that your hands were getting clean with the micro-beads going to work. Once I was done washing my hands I felt refreshed and my hands felt clean. Dial's Deep Cleansing Moisturizing Hand Soaps are now available at your local retailer and can be purchase between the price of $2.99-3.99. To find out more about Dial and their products, feel free to check them out on their website and Facebook. Disclosure: All opinions are my own. 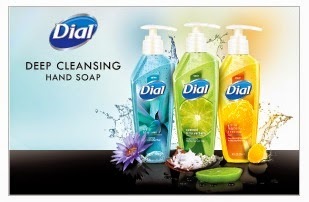 I received samples of Dial Deep Cleansing Hand Soap at no cost for the purpose of this review. No other compensation was received.